Cylvia Hayes ’94, MES ’97 grew up poor in the rural Duvall-Carnation area east of Seattle. 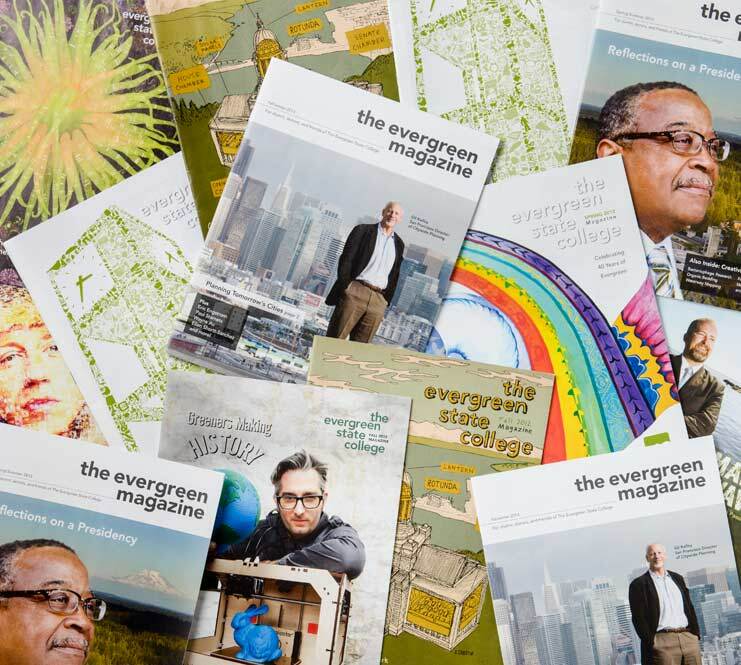 This article was originally written for the Fall 2013 issue of The Evergreen Magazine. She left home at 16, living with friends until she finished high school. Before enrolling in college, she worked in a series of tough jobs that included apple picking, catching fryer chickens, and operating heavy equipment. Today, Hayes lives in Mahonia Hall, the governor’s mansion in Salem, Oregon. Hayes is now the first lady of Oregon. As the longtime partner of Gov. John Kitzhaber, she’s come under particular scrutiny from the media over the last few years, not only for the couple’s politically non-traditional relationship, but also for how she’s reshaping the first lady role. What is often overlooked is that Hayes had become a mover and shaker in her own right well before January 2011, when she and Kitzhaber took up residence in the governor’s mansion. By that point, her credentials as an environmental leader were already established and she was known throughout the state as a visionary and an agent of change. Outside the Oregon governor’s mansion, Mahonia Hall, environmental consultant and advocate Cylvia Hayes ’94, MES ’97, with her Rhodesian ridgeback, Tessa. Upon completing the MES program, she relocated to Bend, Oregon with her unfinished master’s thesis on her laptop, her poodle and her Rottweiler. Initially, they lived in her “old beater car.” She finished her thesis and dove into the local environmental scene, at first doing “piecemeal contract work,” as she puts it, for the Central Oregon Environmental Center. “They embraced me and gave me the chance to get a foothold in central Oregon,” she said. From there, her career blossomed. In 1998, Hayes founded 3EStrategies, a Bend-based clean-economy consulting firm. The firm’s name refers to its focus on promoting strategies incorporating three fundamental aspects of sustainability: equity, ecology, and economy. Her areas of expertise include green building, sustainable energy, and sustainable economic development. 3EStrategies grew out of the nonprofit organization Hayes launched two years before, called Earth Connections. It was devoted to raising local environmental awareness and accelerating the transition to sustainable living practices through education and advocacy. Hayes also co-founded Friends of Bend, a smart-growth organization. During the course of her career, she’s been named a fellow of the Clean Economy Development Center, the Center for State Innovation, and the American Leadership Forum. She sat on the Sustainability Committee of the Oregon Progress Forum and graduated from the League of Conservation Voters Environmental Leadership Institute. Over time, her relationship with Kitzhaber evolved from professional to personal. She certainly hasn’t lost sight of her love for the environment and her desire to protect it by building a sustainable society. She advises the governor on clean energy and green economic development issues and she counts ocean health as one of her professional areas of action. Early in her career, she considered becoming a marine biologist, and her concern about the condition of the planet’s oceans—particularly with regard to ocean acidification and climate change—has led her to address ocean stewardship on the West Coast, which has a big stake in preserving its important coastal and marine resources. Her major project as the first lady is the Oregon Prosperity Initiative, an antipoverty program launched last year. Through a number of strategic partnerships, she’s spearheading the development of a game plan to reduce hunger and increase prosperity for residents of the state, where one in five children live in a food-insecure household, and more than half of the students live in families that earn so little that they qualify for free and reduced price meals at school. She said the initiative’s goal is “to ensure that every Oregonian has a pathway to economic security, a healthy life, and engaged citizenship. It recognizes that poverty is not just a human tragedy, but also an issue that is both critical to economic and workforce development and stems from a complex set of systemic factors, all of which must be addressed as a whole.” The initiative aims to lower the current poverty level from 15.5 percent to below 10 percent by 2020 and below 5 percent by 2025, raise income levels to above the national average by 2020, and reduce income inequality by 2025. Hayes’ professional rise didn’t make being Oregon’s first lady any easier. Traditionally, the role has been low profile in nature and social in responsibility. “It hasn’t caught up to accepting a professional, policy-driven woman,” said Hayes, an active person who runs, does strength training, and meditates daily. “It’s been harder to do substantive work than I expected.” Nevertheless, her days are varied and busy, often spent with her Rhodesian ridgeback, Tessa, by her side, and often involving frequent phone calls, meetings, appearances, planning sessions, her professional policy work, her “first-lady type duties,” and quite a bit of writing for speeches, articles, and blogs.